Do Ho Suh is a wanderer. He is compelled to move but always wants to bring home with him. Since he has developed the ability to make a home wherever he is, things are starting to pile up. A case in point is Suh's signature transportable fabric installation piece, Seoul Home... (1999), a diaphanous, ghostly green, full-scale rendition of his traditional Korean childhood residence. It serves Suh as a kind of security blanket, which can be packed in a suitcase. As Seoul Home... travels from one exhibition site to another, its title is amended to reflect that history: Seoul Home/L.A. Home/New York Home/Baltimore Home/London Home/Seattle Home... In this way, Seoul always remains the point of origin, but recedes into memory as “home” becomes an aggregate of every place the piece goes. While Seoul Home... was not itself included in Suh's recent show at Lehmann Maupin, its presence reverberated throughout the exhibition. It first appeared as a parachute in Fallen Star 1/5, a 1/5-scale model of the Rhode Island house where Suh lived while attending RISD, with his childhood Korean home crashed into the back of it. The house-parachute, deflated on the floor, softened the impact. A monument of craftsmanship and detail, Fallen Star 1/5 pays homage to the jarring cultural displacement and homesickness Suh felt landing in the U.S. as an undergrad. Standing over ten feet tall and sliced diagonally to reveal its interior, Fallen Star 1/5 endlessly fascinates. In the Rhode Island home, which is divided into several apartments, the sheer quantity of objects speaks to the American preoccupation with material accumulation while revealing who its residents are: skateboards and heavy metal posters for the rebellious adolescent, African statues and framed fine art repros for the globe trotter, and so on. 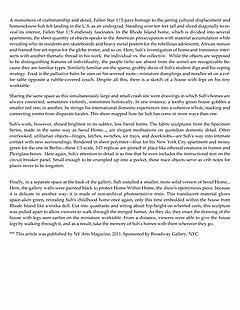 Here, Suh's investigation of home and transience intersects with another thematic thread in his work: the individual vs. the collective. While the objects are supposed to be distinguishing features of individuality, the people (who are absent from the scene) are recognizable because they are familiar types. Similarly familiar are the sparse, grubby decor of Suh's student digs and his coping strategy. Food is the palliative balm he uses on his severed roots—miniature dumplings and noodles sit on a coffee table opposite a rubble-covered couch. Despite all this, there is a sketch of a house with legs on his tiny worktable. Sharing the same space as this simultaneously large and small crash site were drawings in which Suh's homes are always connected, sometimes violently, sometimes holistically. In one instance, a toothy green house gobbles a smaller red one; in another, he strings his international domestic experiences into a cohesive whole, stacking and connecting rooms from disparate locales. This show mapped how far Suh has come in more ways than one. Suh's work, however, shined brightest in its subtler, less literal forms. The fabric sculptures from the Specimen Series, made in the same way as Seoul Home..., are elegant meditations on quotidian domestic detail. Often overlooked, utilitarian objects—hinges, latches, switches, ice trays, and doorknobs—are Suh's way into intimate contact with new surroundings. Rendered in sheer polyester—blue for his New York City apartment and mossy green for the one in Berlin—these 1:1-scale, 3-D replicas are pinned in place like ethereal creatures in frames and Plexiglass boxes. Here again, Suh's attention to detail is so fine that he even includes the instructional text on the circuit breaker panel. Small enough to be crumpled up into a pocket, these trace objects serve as crib notes for places never to be forgotten. Finally, in a separate space at the back of the gallery, Suh installed a smaller, more solid version of Seoul Home... Here, the gallery walls were painted black to protect Home Within Home, the show's eponymous piece, because it is delicate in another way: it is made of non-archival photosensitive resin. This translucent material glows space-alien green, revealing Suh's childhood home once again, only this time embedded within the house from Rhode Island like a troika doll. Cut into quadrants and sitting about hip-height on wheeled carts, this sculpture was pulled apart to allow viewers to walk through the merged homes. As they do, they enact the drawing of the house with legs seen earlier on the miniature worktable. From a distance, viewers were able to give the house legs by walking through it, and as a result, take the memory of Suh's homes with them wherever they go.